1. The work you have in your book needs to show that you add value to the agency so it is important to not only have excellent test shoot images, but work from paid jobs and tear sheets (work that was published and is in print) as well. 2. Your book should show the agency you have experience working on multiple sets with a full crew so they have confidence sending you on a variety of assignments. They should be able to tell this by the types of clients you have on your resume. 3. Your portfolio should be immaculate and beautifully presented. Don’t take the words ‘tear sheet’ literally. They will ideally want to see a book full of neatly cut out full page tears. 4. Of course every agent is different but most will want to see you are confident producing clean beauty looks. Clean looks also show the agent that you know how to edit your work. 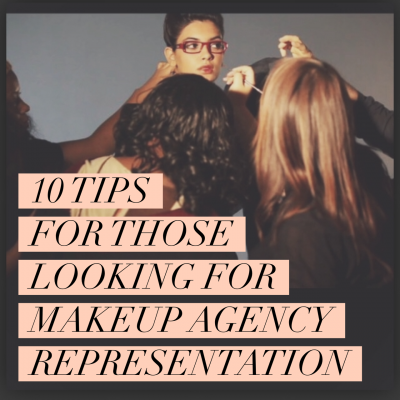 The “no makeup-makeup” is a basic “must know” to be signed by a bigger agency. 5. When building your book ‘Say no to random stuff on the face.’ This opinion was shared by many of the agencies speaking at The Makeup Show in LA. No feathers, no rhinestones, no crazy colorful lashes, and no gold leaf when you’re testing. 6. Agencies can spot a bad or overdone Photoshop job a mile off and generally don’t want to see overly Photoshopped images from tests in your book . If your photos show skin that is butter smooth without any realistic texture but all the texture in your eyeshadow and lashes are still there, then it was over photoshopped. If the entire picture is perfectly smooth to the point of looking blurry, it is not useable. 7. Before approaching an agency it is really important to do your home work. They will want to know that you have studied their artists and their work and that it matches what you want to do with your career. 8. Assisting the artists at a top agency is a great way to start building your relationship with the agency. If you call the agency to put yourself forward for assisting opportunities mention specific artists you would like to assist. This gives them an idea of the direction you want to take your work and your inspiration. Be sure to also make it known that you are available to assist all of their artists so they know you are willing to assist anyone they represent to prove yourself. They want to see dedication. 9. Once you feel your book is ready you need to start by calling the agencies or checking the websites of the agencies that you are interested in to find out what their submission process is. Also ask if they are adding artists to their roster. Do not pester the agencies or artists if you do not hear back right away as it one of the surest way to put them off. Allow a good amount of time before reapproaching them with new updates on work as well if they didn’t have a spot for you at the time you called. I waited about 3 months and reapproached my current agency with new tearsheets, magazine covers, and clients before they signed me. 10. Not sure if your book is good enough to take to an agency? As a guideline when you are ready your work should be in line with the other artists represented by the agencies you are approaching. When in doubt, ask a working artist in your area or online that you feel would help give you a candid opinion. Have you approached an agency lately? What other feedback could you leave for your fellow artists. Please comment below, I’d love to hear from you. *Thank you to “What the Pros do” for the writeup of this very article years back. I have revamped it to add a bit more information. May sound silly but My question is how do you begin getting the ‘right’ clients to impress the agency and get tearsheets ? Not silly at all. It starts with working with the right models to properly show off your “clean” beauty work. From there you start to attract the right photographers when you reach out to them showing you can do that type of makeup. Check the smaller local magazines and find the names of the photographers who shot any of the photos in those magazines. Those photographers are usually the ones working with clients on jobs and a number of them recommend artists for smaller jobs they may have. Get more of those types of jobs that will lead to bigger jobs, and then to agency representation. Having a website that shows clean work on a number of different models is key. If you must, hire a photographer who has access to agency models who can get you looks for your portfolio. My husband does portfolio work for makeup artists all the time. It is a good investment towards attracting the right kind of clients. Last but not least, don’t be discouraged. It is a process that can’t be rushed.